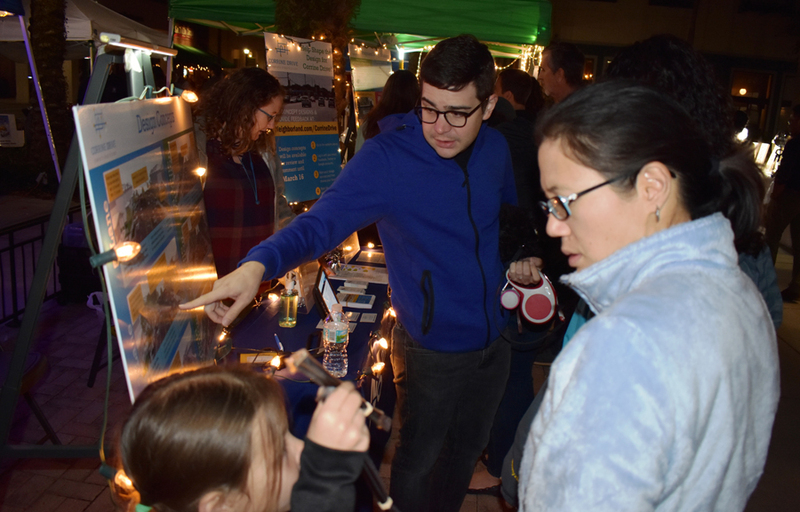 Participants discuss Corrine Drive concepts at our table at the Baldwin Park First Friday Festival in 2018. Survey respondents did not agree on the best solution. No design concept received majority support in the question that asked which design was preferred for Corrine Drive. Though this feedback was not used as a vote on which design to move forward, it provided valuable information on which features were most important to the community and how we might approach compromises on the final plan. There was clear support for pedestrian and bicycle facilities, which are sorely lacking on the current road. Again, however, there was disagreement on how best to address this need. Most of the proposed safety solutions were heartily supported, pointing to the community’s desire to see safety issues addressed. The Community Feedback Report discusses results on each design concept and safety solution, as well as additional information on how the support broke down by neighborhood and relationship to Corrine Drive. The final phase of the Corrine Drive Complete Streets Study involves refining ideas from the design concepts and safety solutions into a plan. MetroPlan Orlando worked with the local government partners to create a final concept that includes features from several concepts, drawing on ideas respondents supported and characteristics best suited to conditions on Corrine Drive. More information about the final phase of the study is available on the main Corrine Drive Complete Streets Study page. We presented three possible overall looks for Corrine Drive, each with a variation. These preliminary design concepts were developed after reviewing the technical data and community response during the first phase of the study. Each reflected a Complete Streets approach by taking into account the needs of all users of the road. In addition to the design concepts, we proposed seven safety solutions that could be implemented with any design concept. For more in-depth technical information, you can take a look at the Draft Corrine Drive Study Phase 2 Report below, which describes in detail the Phase 2 process and offers more detailed drawings of each design concept and safety solution. We discovered an inaccurate reporting of the 3-Lane Concept travel time statistic in our Corrine Drive study materials and have made a correction. Our materials first stated that the rush hour travel time for the 3-Lane Concept and 3-Lane Concept Variation is 27.3 minutes in the morning. The morning rush hour travel time is being corrected to 29.8 minutes. The evening drive time is still 23.8 minutes, as originally reported. We’re deeply sorry for this data input error. It does not reflect the high standards of transportation planning that we set for ourselves. We’re sharing this in our continuing effort to be open, honest, and transparent with this study. • Travel time reports for all the design concepts (5-Lane, 3-Lane, Hybrid, and their variations) have been rechecked. No other errors were found. • We have updated the technical report below to include this correction and a new appendix, which includes a memo on how the travel times were calculated, the engineering spreadsheet with the calculations, and copies of the output reports from the computer software that was used to run the travel times. This additional information, while highly technical, presents all the data behind the summary calculations that accompany the design concepts. • We are reviewing our quality control processes to see what needs to be changed to ensure that this type of data input error does not occur again. We offered participants a chance to update their opinions if this correction changed their minds about any of the design concepts.